Trinity’s music program is wide-ranging, allowing for a variety of musical exploration, both within ensemble settings and as an individual. As performers, students can hone their voices in chorus and the extracurricular a cappella group, the Tritones. They can acquire guitar skills in three progressively-sequenced levels of guitar classes or develop and refine instrumental skills within an ensemble setting by playing in concert, jazz or pep band or one of the orchestra groups. There are also course options for those interested in learning to appreciate, write, edit and produce music. The highest level of student music education falls under the IB music courses. With the proper prerequisites and teacher recommendations, students can enroll in any of the offered IB music courses, which leads students in a challenging exploration of music theory, music history, world music cultures, performance and composition. 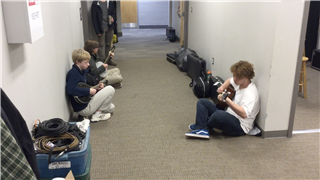 The music program is dynamic and intertwined with the life of school. Students perform at lunchtime concerts at Pach's Place, as house band musicians for Cabaret, as accompaniment for the caroling during the Grand Illumination, as pit orchestra members for a musical and as a vital part of the school's spirit at football and basketball games. Students and faculty constantly collaborate, experiment, and ultimately expand their range of talents to make each event special and memorable. The tenacity and determination of music students to improve constantly is evident and showcases the kind of character development that happens every day at Trinity. The Perkinson Arts Center houses a comprehensive music suite consisting of a large rehearsal hall for instrumental and vocal ensembles, a practice room for individual or small group use, a digital music lab with 9 computer and synthesizer workstations and a recording control room. The control room in conjunction with the rehearsal hall and an isolation booth forms an impressively functional recording studio.